in Creative & Tech with tags Game of Thrones, HBO, social media marketing, Twitter Emoji Engine Both comments and trackbacks are closed. For the past six seasons of Game of Thrones, we’ve been told that “Winter Is Coming”. 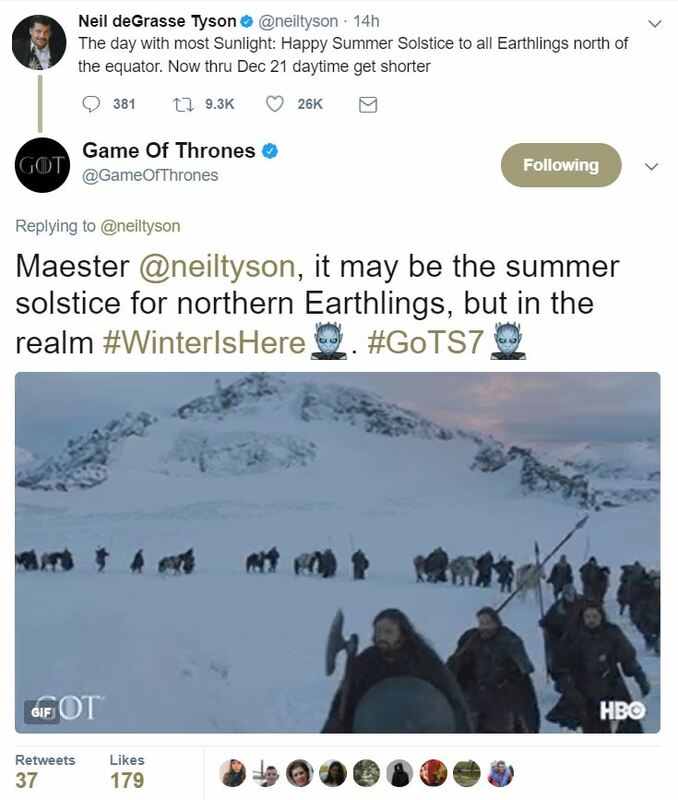 On the Summer Solstice, June 21, HBO confirmed the long-predicted theory and declared that Winter Is Here in Season 7, with a clever “winterizing” blitz of activations across social, digital and broadcast. With over a year since the last episode of Game of Thrones had aired, HBO worked with 360i to conceive an activation that would disrupt fans in a summer mindset and remind them that #WinterIsHere and Season 7 is only a few weeks away. HBO kicked off the Summer Solstice with a new, winter-themed trailer for Season 7, announcing #WinterIsHere. 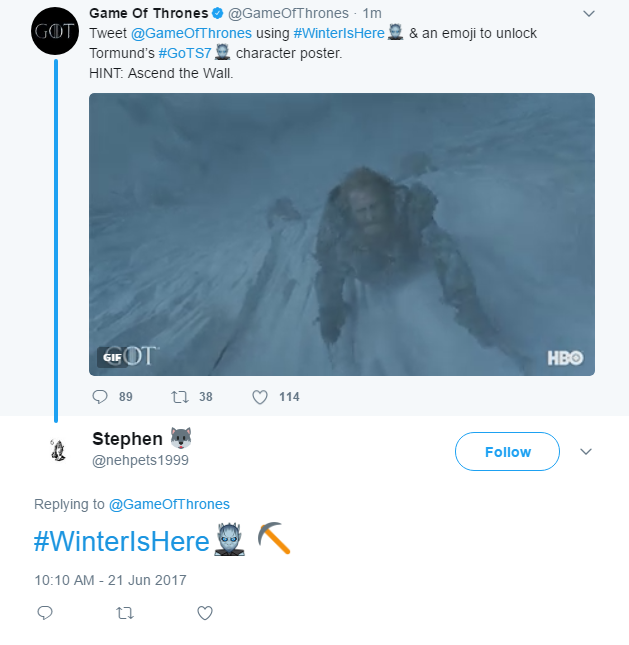 As soon as the trailer dropped, Game of Thrones activated a Twitter Emoji Engine, that gave fans the chance to unlock all 12 Season 7 character posters through use of clever combinations of #WinterIsHere + [an emoji] tweeted @GameOfThrones. This marks the first time the tool has been used to release key marketing materials of this stature. Throughout the day, Game of Thrones responded in real-time to summer-themed conversations happening on Twitter, sharing winter-themed gifs, and reminding everyone that despite the warm weather, #WinterIsHere on July 16. Additionally, use of the #WinterIsHere hashtag activated a special Night King Hashflag graphic and certain emojis triggered content related to other HBO shows. Other integrated campaign activations included a first-ever branded gift exchange for the one million plus Game of Thrones subscribers on Reddit, a first to market TV series reimagining of Reddit’s masthead alien mascot (from Snoo to a Game of Thrones inspired “Jon Snoo”), real-time posts and updates in Game of Thrones Google search results page, and finally, a #WinterIsHere primetime marathon on HBO 2. From the innovative Season 7 date reveal on Facebook Live, to breaking records with the total views on the first trailer, HBO has continued to create a promotional campaign that is as epic and memorable as the show itself. Don’t forget to tune-in to Game of Thrones Season 7 premiering Sunday, July 16 on HBO. 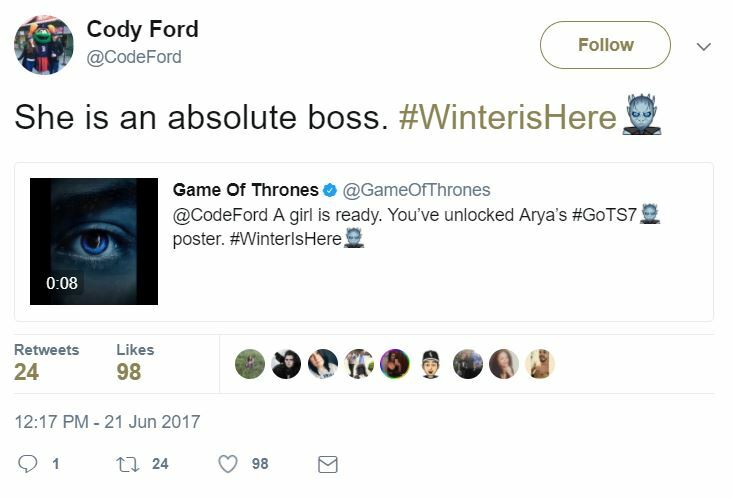 Read more about the #WinterIsHere campaign in Mashable.